The M60D Enhanced is a mounted version of the standard M60E4/Mk43. It can be mounted on boats and vehicles, or as a pintle-mounted door gun in helicopters. The M60D Enhanced features a redesigned machined aluminum feed cover with integrated M1913 Picatinny rail for mounting optics and a forward M1913 Picatinny rail for other sensors, giving the weapon 24-hour capability. 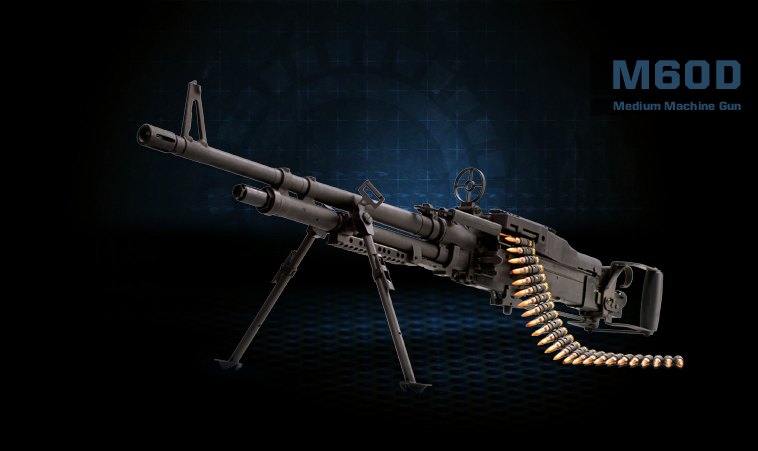 The M60D Enhanced is a gas-operated, disintegrating-link, belt-fed, air-cooled machine gun. It fires from an open bolt and features a quick-change Stellite®-lined barrel. It is fitted with spade grips for flexible use and an aircraft ring sight for rapid target acquisition. A canvas bag can be affixed to the gun to capture ejected casings and links, preventing them from being sucked into the rotor blades or into an engine intake. The M60D Enhanced is used on the UH-1B Huey (using the M23, XM29, M59 and Sagami mounts), the CH-47 Chinook (using the M24 and M41 mounts) in both door and ramp locations, the ACH-47A “Guns-A-Go-Go” variant of the Chinook (using the XM32 and XM33 mounts) and on the UH-60 Black Hawk (using the M144 mount). An “egress kit,” or “infantry modification kit,” is available to provide downed aircrew personnel with increased fire power. However, the weapon’s usual configuration is with a bipod and sling mount for ground use.